As its logical starting place the SCIET revisits the concept of the point with the ambition that it should describe both the Universe and its smallest part. Communicating the range of ideas required to teach an understanding of how this is true has led to SCIET Dynamics and the variety of specialized ideas and concepts shown on this site. The SCIET derives from a single measure, the distance between the center and the edge, and maps all the space surrounding the center through equidistant angularities and subdivisions while retaining that definition of their existence together as a permanent record. The measure is as unlimited as the Awareness from which it came. There is no limit on smallness or largeness except the speed of change itself. Any definable location in space is a SCIET and all intersections are expressible as SCIETs. Thus a SCIET continually reduces into smaller SCIETs until the original measure seems to vanish into the space of itself. It is the notion that all points in space are definable as SCIETs that makes this possible. SCIET in Relationship is point-to-point. Receptive harmonics manifest geometric shape resonant maps during the Relationship reduction cycle, and these forms of Relationship continue to underlie all of creation. A is the SCIETangle and B And C show the relationship to Tetrons while E and F show the dodecahedron inside of the icosahedron shape of the SCIET to create a map of the Unitary Value phase of Harmonic Receptive Reduction . The SCIET is the source of the geometry of space. Relationship is based on line, composed entirely of two dimensional relationships. Extending this idea into a three dimensional framework requires a careful analysis of the nature of the Void and how it limits the application of generalities to the stages of creation. It is understood that only one measure is possible within the Void, that being the line between two points. Building a multidimensional space from this must follow these limitations faithfully, and this is the basis of the SCIET which uses a single measure fractionally to establish all parts of the form. The requirement for an omnidirectional form follows from the hole-in-space, the Tetron, which exists at the boundary of the Void when a difference exists. The difference is a creation that begins with a First Action, defined as an expression of awareness of difference within the Void, which is better described as the Limitless Awareness, an undifferentiated potential underlying existence itself. SCIET Frequency Potential Levels are the basis for Awareness and the Creation Substance with Limitation thus enabling reduction and the beginning of Relationship setting the stage for Culmination. (See Fractional Harmonic Receptive Reduction below). An example of this idea being used in nature is the fovea of the eye, which has evolved specifically to receive the most focused part of the incoming image. Frequency Potential Levels can be visualized as a sea of tiny SCIETs that will interact only based on Harmonic Fractional Receptive Reduction values. A fractional harmonic of the Frequency Potential levels is accessible at the center of a SCIET at that fractional harmonic value. The Frequency Potential Level of the Creation Substance is the speed of light or C.
SCIET Magnitude is the relationship between the Unitary Value and the SCIET’s Point Value. The Unitary Value subdivides through Harmonic Fractional Receptive Reduction to its smallest measure, 1/1,048,512th. A SCIET Magnitude is 1048512 in 1 Every SCIET Harmonic Receptive Reduction fractionally subdivides the Unitary Value twenty times to reach its smallest segment, the SCIET Point of Magnitude where all angles of the SCIET originate. We can combine SCIET Frequency Potential Levels with SCIET Magnitude and infer a method for the Awareness to establish a relationship with the Creation Substance. The Awareness is a Magnitude faster and smaller than the Creation Substance allowing the Awareness to inhabit the Substance with an ability to establish Unitary Values within it. The SCIET Unitary Value is undivided in its length while the SCIET Point of Magnitude is the smallest segment after twenty subdivisions of the Unitary Value. Harmonic Receptive Reduction fractionally subdivides the Unitary Value twenty times to reach its smallest segment, and a new Unitary Value the SCIET Point of Magnitude where all angles of the SCIET originate. So the Frequency Potential Level of the Awareness is pulsing at one over one million forty-eight thousand five-hundred twelve faster than the Creation Substance and and it is aware of all frequencies within the Substance, whose Frequency Potential Level’s smallest segment is a Magnitude larger than the Awareness. The limitless Awareness defines the Creation Substance as a Frequency Potential Level at a Magnitude slower rate and then expresses a Unitary Value from its center to the edge of the substance, which then reduces (Harmonic Fractional Receptive Reduction) until it reaches the Creation Substance Frequency Potential Level where it Culminates as a unitary value, meaning that for a moment all the reduced SCIETs react as one before the next pulse begins resonance. The Culmination is a single pulse event marking the boundary between change in a system and its integration of that change. The importance of the SCIET Magnitude is related to the Culmination and thus holograms, neurological integration and change in all natural systems. Culmination in a system is related to the idea of limitation in the Creation itself. A created system has a beginning and the Culmination occurs when the initial defined value subdivides to a value equal to the smallest, fastest value possible in that SCIET range. The resulting value is individuated and becomes resonant within the frequency values defined by the prior subdivisions. At the creation this resulted in the formation of protons based on the smallest and fastest resonant values, which remain in continuous resonant relationship. Culmination is the basis of the holographic effect. Interestingly, the frequency required to achieve Magnitude Culmination may be the same frequency that will shatter an object and stimulate the effect. The holographic effect was discovered when a researcher broke a photographic plate and saw that all the tiny pieces had all developed a whole image. Another example is that when a soap bubble bursts it immediately culminates into its receptive reduction values, with the droplets in the mist created by the burst being tiny bubbles rather than droplets of water. Culmination occurs in all created systems at the end of the SCIET Cycle. Culmination in Relationship creates tiny versions of the original, which also culminate. It is particularly noteworthy in the nervous system where it distributes new information to all cells and governs all the transitions between value ranges, its actual form adapting to the needs of the newly defined system. All of the above concepts and ideas set the stage for Agreement, the creation of matter and then in Memory, the stage of life, and the frequency rules for evolutionary processes. 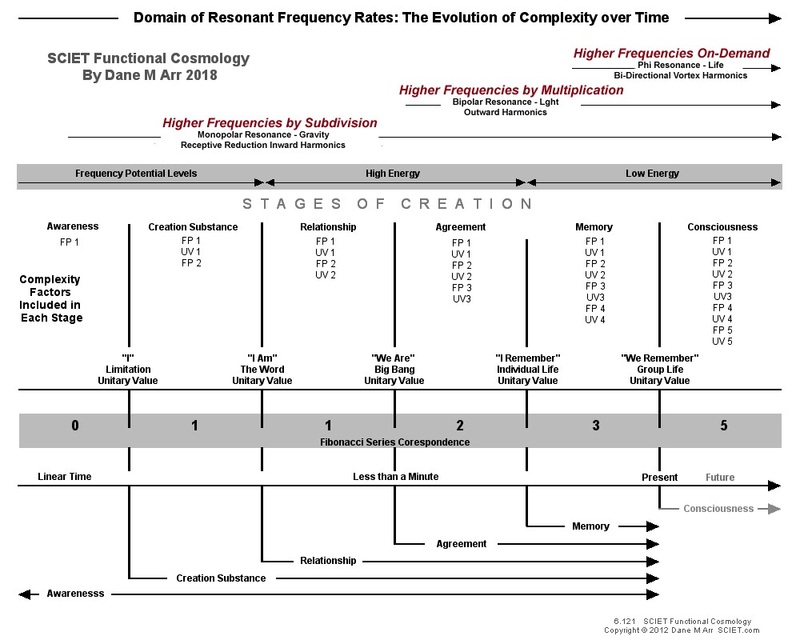 The below table graphic shows the increase of complexity over the duration of creation stages. The Domain Frequency Rate has become more complex with the growth of the Universe. The illustration above shows the sequence of stages and their relationship to complexity over time. The identification of the life frequencies with super conducting cellular resonance and the Phi growth ratio is pivotal, as is the recognition that higher frequencies are attainable with both reduction and radiant processes. It is the combination of these that enable Awareness to move smoothly from the deep frequencies within the DNA from the Infinitesimal Substrate (Creation Substance) to express the patterns of the DNA into a living being by increasing complexity over time. SCIETspheres are memories of every change since the Culmination, so the universe is filled with the shells, layers and lattice from SCIETsphere formation since the beginning of Agreement. SCIETsphere formation is the basis of all shells, layers and lattice and all contain records accumulated since their origin. Lattice Domains are the result of the long term evolution of SCIETspheres after the culmination. The high energy domain of the stage of Agreement provides the basis of shell formation and molecular Consolidation. Next is the cellular consciousness field, which compounds into the somatic body, the living but unanimated form. The third is the sense domain which is created by the nervous system’s processing of the input from the environment. The forth is the focal consciousness field which is created by the merging of the two sensate fields into a frequency realm that exists independent of materiality, and it is the “door” through which we enter the vibration body’s aetheric quanta layer field. The Lattice Domains generated by the dual inputs of the nervous system react to one another and create a Third SCIET Lattice Domain. The molecular lattice, made of protons, neutrons and electrons, is the matter in our bodies that resonates with the earth’s dense surface layers (gavity).). We experience this as weight and inertial mass. Their collective frequencies are used to manage molecular bonds and compounding such an amino acid formation. In the mass of the body these frequencies enable the autonomic nervous system to regulate the functions of the body in the absence of the self or animating being. The evolution of the central nervous system is the consequence of the sensate fields interaction with the frequency bodies of their environment. Forward movement “parts” the frequency body of the cellular organism, “brushing” the field reactions to each side. From a molecular perspective the cell is immense and the complex of fields that react to gravity take time to adjust to the new position on the earth. This “parting” and “brushing” is the fundamental source of hemispheric bi-lateralization and duality in moving organisms, or animal. In this sense, the central nervous system is the evolved consequence of the same phenomenon that causes momentum. The sense organs evolved from the skin, each focusing to a particular range body field values. Forward motion divided the field inputs and set the stage for the pattern of side to side charge exchange that we observe in the electrical activity of the brain. So the nervous system is actually two nervous systems that are united by the corpus collosum. At birth only a small portion of these connections are made, and it is not until about 10 years of age that enough are in place for the individual to gain the consistent mental function associated with adolescence. There are a number of theories for this, but SCIET theory is that the brain is a “tuner” and the electrical activity that arcs across the hemispheres stimulates the growth of axons and dendrites at the matching hemispheric sites where simultaneous firing will generate or “tune” a capacitance lattice where information is stored as charged space relationships. Hemispheric bi-lateralization and hemispheric reversal are natural consequences of space processing. The connection of the body to the focal consciousness domain involves a lifelong developmental process whose early foundations are pivotal to spiritual as well as mental potential. Each brain hemisphere receives a flow of nerve energy (much more than electricity) from the senses on one side of the body, resulting in a simultaneous opposing charge. The shifting of this potential from one side to the other drives the processes of thought. We mirror the world around us in our brains. The internal modeling process is part of a feedback loop that utilizes two inputs of the same information to provoke a spark of electrical discharge between the hemispheres. This third field, the vehicle of our focus, exists at the level of aetheric quanta layers, a realm where the self is without boundary. The ability to move the focal consciousness field is not limited to the physical body, and the projection of focus or “attention” externally is as normal as reading, watching a basketball game or driving a car, all examples of external focus. The division between the auditory and visual system that is evidenced by brain research, is derived from the distinct differences of light and sound. Sound travels about one-quarter mile per second and light travels 186,000 miles per second, that is about 750,000 times faster. Even though all of our nerves function at the same rate of speed, the dramatic difference in source of input necessitates quite different processing systems. The fact that most people “hear”a voice in their heads and can “see” with their imagination, indicates that our minds have synthesized a remarkably effective system of fields to deal with this incredible disparity in source speeds, and the subsequent realistic modeling. The SCIET Functional Cosmology integrates the ideas of SCIET Dynamics into an explanation that progresses in stages related to the evolution of the Universe. Is the Brain the Receiver of Consciousness?